The Philippine Supreme Court released the official list of passers for October 2014 Bar Examinations on March 26, 2015 and after the special en banc session of the Supreme Court. The Bar Exams for 2014 was held at the University of Santo Tomas. A total of 6,344 law students took the bar exams last October 5, 12, 19, and 26, 2014. They will also announced the list of topnotchers from the said bar exam. Supreme Court Associate Justice Diosdado Peralta said that there will be 80% essay questions and 20% multiple choice questions, that's the structure of the bar exams. The 113th bar exams has initial list of confirmed 6,344 examinees but on the second day of exam, a total of 350 takers have already opted to back out. According to report, the high security was impose to the day of examinations, the SC and UST prohibit the use of sidewalks around the campus because of the "no walk" policy for the four Sundays of October. There's also a report that the Supreme Court lowered the passing grade to 70 percent, because during the 2013 Bar Examinations, the Supreme Court also lowered the passing grade to 73 percent. 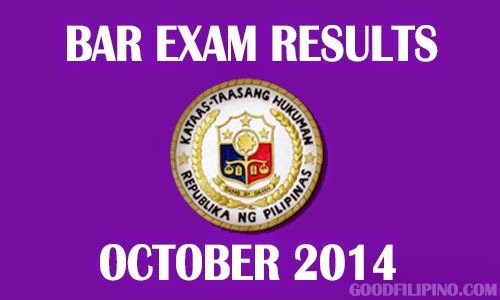 If you're one of bar examinees on October 2014, then this page is for you! you may bookmark it now and use it as your reference once the official list of passers released. For more information about Bar Examinations Results 2014, kindly bookmark this page and share to your joined social networking sites. Comments or suggestions about "Philippine Bar Exam Results 2014 - List of Passers (March 2015)" is important to us, you may share it by using the comment box below.